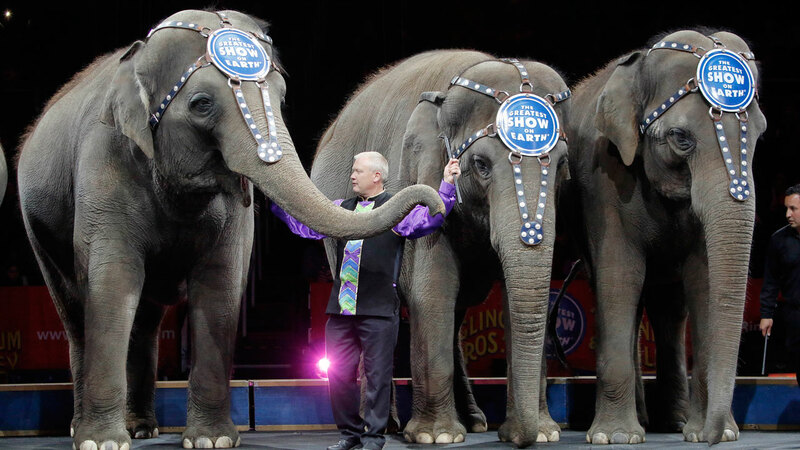 PROVIDENCE, RI -- Ringling Bros. and Barnum & Bailey Circus bid farewell to its performing elephants on Sunday, as the show closed its own chapter on a practice that has entertained audiences in America for two centuries but has come under fire by animal rights activists. "This is a very emotional time for us," Ringmaster Johnathan Lee Iverson told the crowd as the performance came to an end in Providence, Rhode Island, on Sunday. He called the six Asian elephants beloved members of the circus family and thanked the animals for more than 100 years of service. "We love our girls. Thank you so much for so many years of joy," he said as the elephants left the ring for a final time. "That's history tonight there, ladies and gentlemen, true American icons." Earlier, the crowd watched as the elephants performed an act that had them dancing, balancing on each others' backs, sitting on their hind legs and pretending to sleep. "We came to say farewell to the elephants," said Sheila Oliver, of East Providence, who brought her 4-year-old daughter, Lilliana. "This is her first circus and, unfortunately, it's their last one." The Providence show opened with the national anthem. An elephant carried a performer holding an American flag then stood at attention as the song ended. A few minutes later, six elephants entered the ring, each holding the tail of the one in front of her. After Sunday's performance, the animals will live at Ringling's 200-acre Center for Elephant Conservation in Florida, said Alana Feld, executive vice president of Feld Entertainment, which owns the circus. Its herd of 40 Asian elephants, the largest in North America, will continue a breeding program and be used in a pediatric cancer research project. The Humane Society says more than a dozen circuses in the United States continue to use elephants. But none tour as widely or are as well-known as Ringling Bros. It's also getting more difficult for circuses to tour with elephants. Dozens of cities have banned the use of bullhooks - used to train elephants - and some states are considering such legislation. Attitudes are shifting about other animals as well. Last month, Sea World announced it would end live orca shows and breeding. Ringling will continue to use animals, Feld said. Sunday's show included horses, lions, tigers, dogs, pigs and other animals. Before Sunday's show, around half a dozen protesters stood outside, including one wearing a lion costume, to protest Ringling's use of animals. The Humane Society has called for an end to the breeding program at Ringling's Florida center, and for the company to retire its elephants to one of two accredited sanctuaries, one in California and one in Tennessee, both of which have more than 2,000 acres of land. An announcer told the crowd before Sunday's performance in Providence about the cancer project. Cancer is less common in elephants than humans, and their cells contain 20 copies of a major cancer-suppressing gene, compared with just one copy in humans. A researcher at the University of Utah is working with Ringling to study the elephants' blood cells.